French police have banned protests on the Champs-Elysees and in its vicinity, which had been slated to take place this Saturday, 23 March, according to their statement. Similar measures have been taken by police in the French cities of Nice, Marseille and Metz. "Didier Lallement, the police prefect, decreed today to ban all gatherings on Saturday, March 23, of people who associate themselves with this movement on Avenue des Champs Elysees… as well as on [Place de] l'Etoile square and in the perimeter around the presidential residence and the National Assembly," a note read. The ban was announced shortly after the statement made by Gen. Bruno Leray, Paris military governor, that warned that the army had been mobilised to protect public order at the upcoming demonstrations in Paris and could open fire if their lives or the lives of people they defend were threatened. Apart from that, a few days ago government spokesman Benjamin Griveaux announced that the Sentinel military anti-terrorist mission would be activated due to the protests. 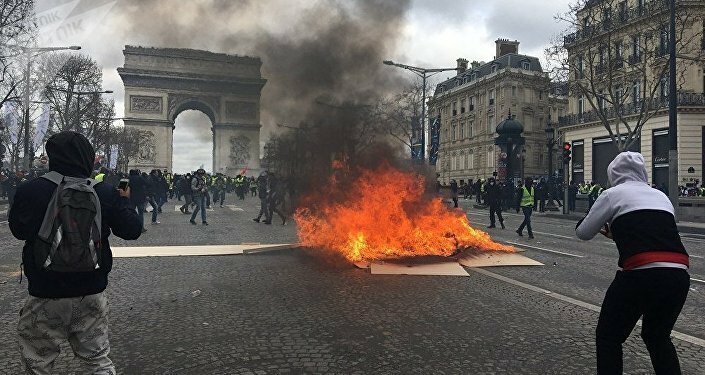 These measures were introduced after last Saturday 5,000 mobilised police forces could not prevent the vicinity of the Champs-Elysees from looters and arsonists. The government fired Paris police chief Michel Delpuech and promised bans on demonstrations in certain areas, naming the Champs Elysees and Capitol Square in Toulouse as examples. The police prefecture of Haute-Garonne has already reportedly banned protests in Capitol Square this Saturday. Although the French government has scrapped the planned fuel tax hike which had triggered the demonstrations initially and offered several other concessions, the weekend protests have continued. In order to solve the existing discord among the French people, the government has launched a special platform for talks.